While it remains to be seen if director Ron Howard's sprawling adaptation of The Dark Tower will ever get off the ground, the filmmaker revealed in September that the project is still not dead yet. Initially envisioned as a theatrical trilogy with two limited run TV series in between each movie, The Dark Tower would have been one of the most ambitious projects in film and television history, although Universal ultimately passed on the project, with Warner Bros. following suit after it was brought to them. 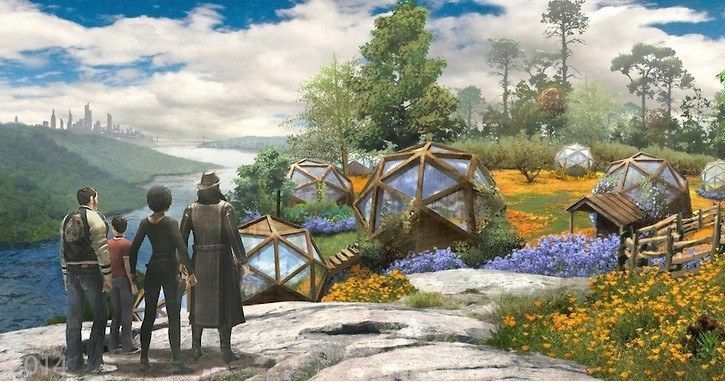 While we wait for any official word on the adaptation's revival, concept artist Gregory Hill revealed two video "fly-throughs" for the town of Tull, and eight concept art illustrations on his official website. We'll be sure to keep you posted if The Dark Tower ever finds new life, but until that day comes, enjoy these new videos and images. At the age of 19, Stephen King decided he would like to write an epic similar to The Lord of the Rings. The series written and published separately over a period of 22 years consists of seven books and the short story, The Little Sisters of Eluria published in his short story collection, Everything's Eventual. The first book, The Gunslinger, introduces Roland Deschain of Gilead as he pursues the man in black to the mountains that separate the desert from the Western Sea. Along the way he rescues the boy, Jake, who is from a different time and place, and soon they become ka-tet in spite of Roland's single-minded goal of reaching the man in black at all costs.